A new birth is cause for celebration. So add some humor to your new baby greeting card. And create a funny greeting card. 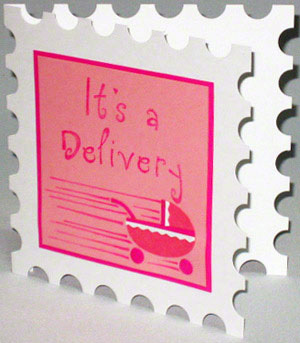 As you can see, this baby greeting card looks like a postage stamp. Therefore, the humor comes from the fact that a postage stamp is for package delivery. And, a new baby is a precious package that comes from a medical delivery. By now, you are probably smiling because you already have a funny phrase to put inside the card that will match this theme. Right? Okay, it's established that this is a funny new baby greeting card. Now, what greeting card message will you write inside to add more humor to the card? Next, lets make the new baby greeting card. On the 3.5” x 3.5” pink blossom cardstock, use rubber stamps and pink ink pad to print “It’s a” on the first line and “Delivery” on the second line, leaving 1.5” space below the finished print. On the 2” x 1.5” pastel red cardstock paper, use the oval template to draw an ellipse of 1” height and 1.5” width. This is the basic shape of the crib. Use the scissors to cut out this oval shape out of the cardstock. Mentally dividing the oval into four equal parts, cut out the top left part of this oval as opening for the crib. Hence, the edge of this cut is 0.75” from the left and 0.5” from the top. On the 1” x 3” strip of pink fairy cardstock, cut out a 1/16” x 3” strip. Save the rest of the 1” x 3” strip. You will use it later below. Glue this 1/16” x 3” strip horizontally in the middle of the oval crib. This covers the whole 2” oval length, leaving about 1” of the strip dangling at the end. Cut this dangling pink strip. Next, glue this cut pink strip vertically on the remaining edge of the crib opening. This leaves about half of the strip dangling at the top. Cut off this excess dangling pink strip. Glue this 3/32” x 3” white zigzag strip horizontally, edge to edge, and directly below the first glued pink strip. Hence the remaining 1" strip is left dangling. Cut this dangling white strip. Next, glue this cut white strip vertically, edge to edge, and directly to the right of the first glued pink strip. This leaves about half of the strip dangling at the top. Cut off this excess dangling white strip. Glue this finished crib to the bottom right of the 3.5” x 3.5” pink blossom paper just below “Delivery.” This becomes about 0.25” and ⅝” from the right and bottom edges of the paper respectively. Pick up what’s left of the 1” x 3” strip of pink fairy cardstock paper you saved earlier. Use pencil and ruler to draw a 0.25” x 0.5” box on this strip. From this box, cut out the handle for the crib. On what’s left of this same strip, use the 0.25” hole punch to punch out two circle pieces for the wheels. Glue the handle of the crib in place on the left edge of the crib opening. Glue the two wheels of the crib in place below the crib and 1” apart from center to center. Use pink colored pencil and ruler to draw speed lines that start close to the crib and disappear toward the left of the paper. Hence, these lines are thickest towards the crib. Score the 5" x 10" white cardstock in the middle and fold it into a 5” x 5” card. Next, use the pencil and ruler to mark off ⅝” from the left and right of all the corners. These lines, which are 3.75” apart per edge, represent the centers of the first and last holes on each edge. With the ruler and pencil, draw 4 more lines on each edge that divide this 3.75” gap into five equal spaces of 0.75” each. Do this for all the four edges. Using these lines and the edge of the paper as circle centers, align the 0.5” hole punch. And punch out a total of six semi circles from each edge. Clean off the pencil marks from this white part of the new baby greeting card. Glue the 3.5” x 3.5” finished pink blossom cardstock paper with the crib and speed lines onto the center of the 3.75” x 3.75” pink fairy cardstock paper. Next, glue this 3.75” x 3.75” pink fairy cardstock paper right in the center of the hole-filled white cardstock paper. Next, simply deliver the funny new baby greeting card and bring laughter to the baby shower celebration. By the way, this pink card is, usually, for a girl. To make one for a boy, simply use different shades of light blue cardstock. Plus blue rubber stamp ink, and colored pencils.